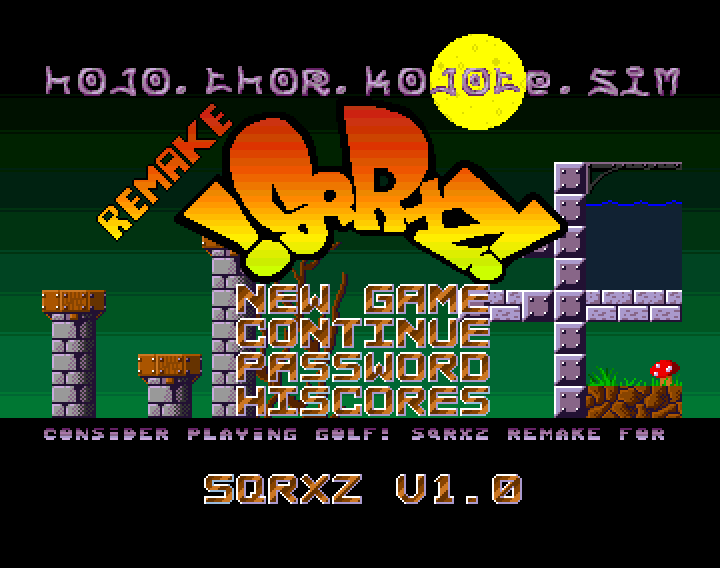 Sqrxz was ported by Frank “Phx” Wille in co-operation with the Retroguru, a development team. The requirements are not high, as you’ll only need an Amiga with Kickstart 1.2 (or higher) and 512 KB of RAM to run it. Without further ado, here’s a video of it running on an Amiga 500. Please pay attention to the joyful chip-music.. excellent listening! That looks like fun. I wish they would make more side-scrolling games. Yes, those games rock!! Did you play the old-school Donkey Kong games on the SNES, pure side-scrolling power..
Donkey Kong Country was awesome! Challenging but awesome. Oh yes, an epic game to say the least. Loved all the mini games and the cart-racing inside the mountains. Hey that’s looking pretty good, shall have to try it out. I know the Amiga has always had a huge demo and music scene but what about new game releases? That’s true and now there is stuff happening on the game front as well. We’ve got the 1980’s Football manager coming up as well.. that is one title I’m really looking forward to. Looks like an awesome little platformer – and you’re spot on with the chiptune call, the music sounds awesome! Love chip-tunes. 🙂 They always make me happy when I’m listening to them. No need to apologize. 😉 Thanks for the links! It’s a shame that Psygnosis has been shut down, but they will always live on in our hearts. They made some of the best games ever.